Read through our Survivor birthday party ideas and incorporate the best birthday party ideas into your party. "Wan´t a Cool Survivor Birthday Party!" Upon arrival issue each child a name badge (label with their names), completed with the survivor logo. Check out our cool Survivor birthday party ideas for invitations. Buy cream coloured card stock and envelopes, download the "CBS Survivor" logo from the internet and put it on the front of the card. Chalk the front of the invitations with black scrapbook chalk (makes it look as it was burned). Inside the card write the party information. Make "worn paper" by wetting and wrinkling it, then iron it out (makes the paper look very old). Print the invitations and tie it with a raffia bow (this invitations are had delivered). On one side of the invitation print "CBS Survivor" logo (download from the internet), and on the other side the party information. "You're invited to "name" Birthday Party! The island location is "address", the adventure will take place the "date" and the challenges will begin at "time" until "time". Wear camouflage, or black, army green and khaki clothes, also bring an item you find useful if stranded on an uninhabited island! RSVP to "phone nr" by "date"." For a Survivor birthday party your daughter and the other kids should dress up in old survivor style clothes. It is important to make a setting as close to an island as possible, use your imagination. The theme colour for this Survivor birthday party is green (in different shades). So hang lots of balloons and streamers in the theme colour. Make lots of survivor logos out of cardboard, cut and paint and put it all over the party room. Place your daughter's stuffed and plastic animals all over the party area - "wild and dangerous". Buy palm trees and flower cut outs and put them every were in the party area. Get sand and put that in a pile on the floor, (a small truckload of sand). Get blue tarp to imitate the ocean, (place duck decoys on it). Decorate the party are with fishnet hanging from the ceiling or walls, also place tikki torches around the jungle - the party area. We have awesome Survivor birthday party ideas for games and activities, just look below. Divide the tribes into two groups, give each group a tube of acrylic paint in white, black, and the tribal colour (blue or green), and some tattoos. Give the tribes 20 minutes to paint their faces with war paint and to get their own tattoos. Make a poster board (beforehand), but the tribes name and it's members names on it (while the kids are painting their faces). No one should be voted off the island (as it's a birthday), instead, they tribes compete for points, both individual and team points. Make lots of small bags of candy - each time a team wins all them members of that team gets their own candy bag. Also, before the competition starts, take a picture of the two tribes together, (use this as thank you notes later). We have lots of yummy Survivor birthday party ideas for food and drinks, have a look below. Survivor Cupcakes: Get some CBS Survivor Logo clipart and glue it onto toothpicks, let it dry. Put the logo on the top of each cupcake. Tropical Punch: Serve punch with fruit in coconut cups. To make this Survivor birthday party cake you need to cook two bunt cakes. When done, let them cool, then turn them upside down and freeze them, before carve them into a volcano shape. Frost the volcano with chocolate frosting. Add red, orange and yellow "lava" frosting coming down the sides, a few plastic palm trees with people along the bottom and sparkle some candles on top of the volcano. To make this Survivor birthday party cake you need to make or buy 24 or 48 chocolate or vanilla cupcakes. Put the cupcakes on a half sheet or full sheet cake platter. Ask your local bakery to print and sell you the tranfer paper of the "CBS Survivor Logo" (download this from the net). 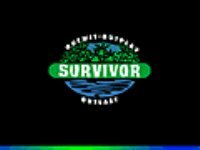 Put the tranfer paper of the "CBS Survivor Logo" on the cupcakes. Then outline and fill it with icing and decorate as if it was a cake covering all the cupcakes. It looks just like a cake, but then you have equal size pieces for everyone! Make party bags out of green lunch bags. Decorated the bags with stickers (rats, bugs, tribal stamps). Write names on the bags with glitter glue pen. Fill the bags with small gadgets, candy, baby bottle pops, a notebook, a pen, tattoos, stickers etc. Use the picture you took of the tribes (before the competitions started), with their faces painted! Send this picture with a Thank You Note to each guest saying something like "Thank You Form Coming To My Survivor Birthday Party". I hope our Survivor birthday party ideas will help you in your planning and I hope your princess will love and enjoy her Survivor party. If you have good Survivor birthday party ideas SHARE them with us. We and other parents around the world will appreciate it.